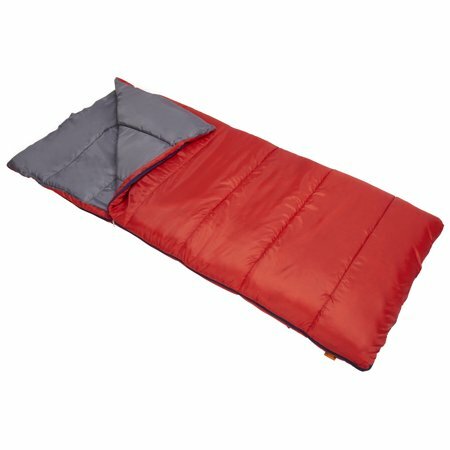 This 50F Warm Weather Sleeping Bag is soft and breathable to keep you comfortable through the night. Pros: It's got more loft than you might expect, elastic roll straps, a stuff bag, and decent quality fabric and stitching. Cons: The zipper does work but it "gets stuck" a little too easily. I would air it out, "carefully" zip it up, and expand the stuff bag prior to first use. I needed a sleeping bag on short notice and on a very limited budget - this was only $9 and I've been impressed so far. I had to sleep in a pretty cold room under an AC vent and I was still a little cold (but someone with a normal body temperature would have been warm!). Quality is good and easy to roll out and up again. Slept in this bag last Sat 1/26 wasn't bad at all since I was in my home. Decent price also. Bought this as a layer of warmth while camping. Worked perfectly fine for that. Washes fine, dries quickly Zipper however was a problem,frayed and disconnected after two uses. The zippers on this one and the zippers on the 40 degree ozark trail sleeping bags are put on improperly.THEY DO NOT ZIP UP. They keep getting stuck on the fabric and it is practically impossible to free them the zipper on this one finally broke after yanking to try to free it. DO DO NOT GET!!! !